﻿Part Deux! We head towards the more bi-lingual part of the Maritimes, New Brunswick. On Monday afternoon the Nook And Cranny restaurant in Truro Nova Scotia found Tara-Lee and I eating corn chowder, drinking tea, and pouring over maps and guide books: semi-planning our next few days, booking kayak adventures and ferry rides, and definitely looking like tourists. Our next stop was the Loch Lommond campground just before the New Brunswick border, and with the assurance that we didn’t need to reserve a spot, we didn’t rush out of Truro until spending some time at another Tim Hortons with tea and wifi, and found ourselves driving again at night through the Maritimes, something we had agreed we wouldn’t try to do, after numerous warnings (from a dozen people) of the plentiful number of moose. No one warned us about the fog. Oh, the fog. Between some night road construction and the thickest fog I have ever witnessed, the hour drive to our campground turned into almost 2. We arrived after the front gate was closed and had to be buzzed in. It was 10:45pm and we were prepared to be lectured about the late hour and ready to beg for forgiveness when we were greeted by the nicest lady at the main office/house who checked us in and seemed to be as much of a night owl as we are, thank goodness. Okay, so the Aulac Tuck Stop. I was told adamantly how great this place is, and I think that by the time we got there for breakfast I was worried I had oversold it to Tara-Lee for the number of times I had mentioned it as a must-stop restaurant. It was excellent. Busy and bustling, we narrowly missed a tour bus that likely filled the restaurant with about 40 people. We got the breakfast plate and promised to come back another time for the chocolate cake with boiled icing or mile-high lemon meringue pie. On to the Hopewell Rocks! 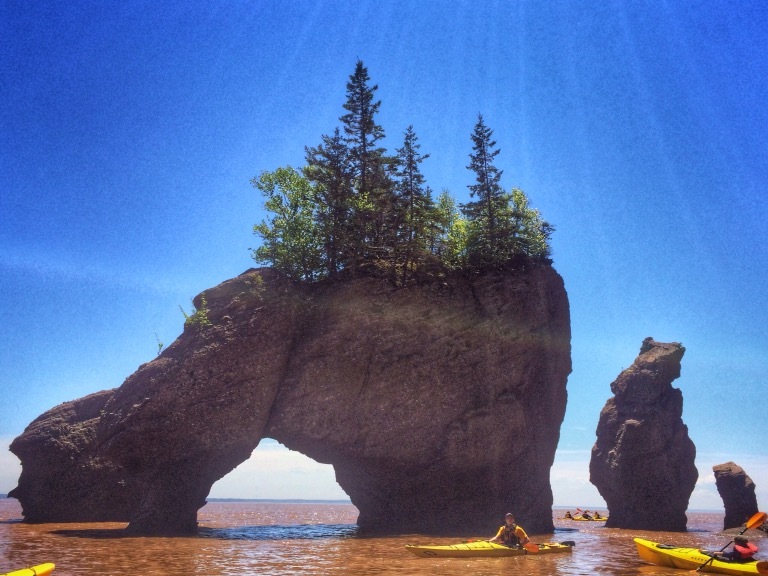 We had a booking for a kayak tour with Baymount Outdoor Adventures at 12:30, to kayak around the rocks at high tide and a final height of 43 feet high! Our cheerful guides Alan and Anna informed us that the Bay of Fundy at the Hopewell Rocks has two high tides and two low tides every 24 hours. (The highest High Tide recorded is 47 feet.) There is admission to the park with a full interpretive centre, restaurant, playground, and gift shop. You wouldn’t believe it but the clouds were dark and thick when we arrived at the park and we were prepared with layers and rain jackets, only to be delightfully surprised with the clouds breaking and full, gorgeous, warm sun for our afternoon on the water. And we got sunburned…. Whoops! Please note the tow-away zone sign we were all encouraged to park in front of. We agreed it is a much kinder nickname of the reddy-brown waters than the imagery of “Mud City”, aka Moncton, NB. In Moncton we found ourselves driving towards a huge spired steeple of a church on the north side of the town, and found ourselves at this gorgeous, ancient-looking Catholic Church: The Lady Of Assumption Cathedral. Even though it looked well over a century old from the outside, the kind caretaker there informed us it was built in the 1930s. He gave us a full tour inside where we discovered that all the stain-glass windows along the sides of the sanctuary were of women from the Bible, which is unique in itself. The attention to detail in the church was amazing. From the tops of pillars having carvings of the main industries in Moncton at the time the church was built (carpentry, farming, fishing, and flying), to the modern mosaics on either side of the pulpit to full multiple-panel stack glass windows telling the story of the Acadians, even the stairs up at the front had the Latin words for the seven steps it takes to become a pope. Our next campsite was further south along the coast at Ponderosa Pines Campground. We had tucked our tent into a small site surrounded by bushes, as we felt like the forecast was not optimistic between the expectations of rain and wind. It was a good plan as the wind was tearing through the area that night at it absolutely dumped rain straight through till morning. We drove back through Aulac, where we split a (gigantic!) 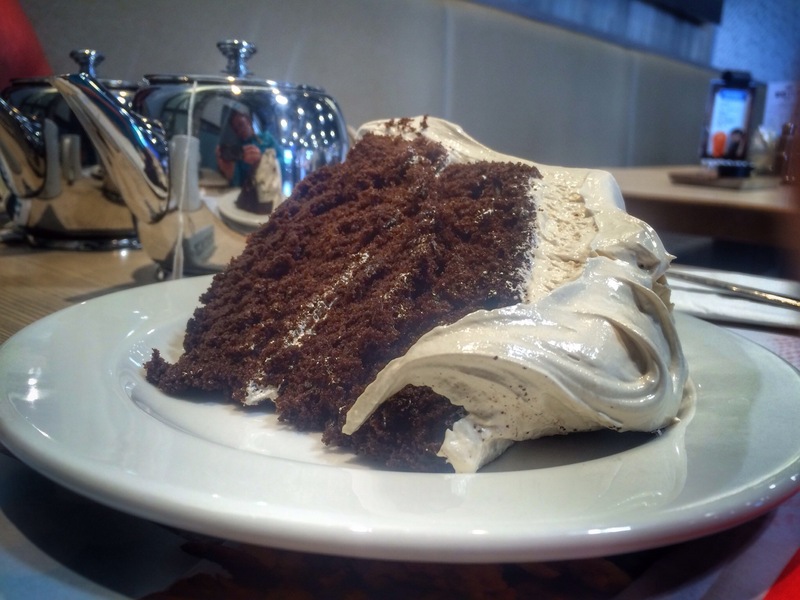 slice of their chocolate cake with boiled icing, which is like a mix between marshmallow and gooey meringue. It was delicious.